Armstrong, Paul and Jeffrey Poss, eds. Space Movement and Light: The Architecture of Jack Sherman Baker, Champaign: School of Architecture, 1997. Asaro, Peter. 2007. “Heinz von Foerster and the Bio-Computing Movements of the 1960s,” in Albert Müller and Karl H. Müller (eds.) An Unfinished Revolution? Heinz von Foerster and the Biological Computer Laboratory | BCL 1958-1976.Vienna, Austria: Edition Echoraum, pp. 253-275. Bohn, James. The Music of American Composer Lejaren A. Hiller, Jr., and an Examination of his Early Works Involving Technology. Lewiston: Edwin Mellen Press, 2004. Fifty Years of Public Computing at the University of Illinois. 2010. organized by Kate Williams. Fortune, Bonnie, and Heather Ault. Mapping Gender, 2009? Mapping Gender is a media project highlighting the roles and contributions of women scholars, athletes and achievers in University of Illinois history. 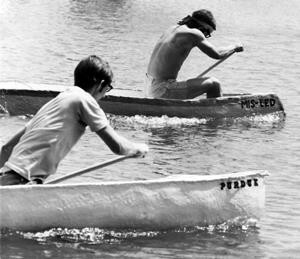 Forty Years of Concrete Canoes. January 5, 2011. _____. Cybernetics on the Prairie, 2011. Hoddeson, Lillian, ed. No Boundaries: University of Illinois Vignettes. University of Illinois Press, 2004. _____ with Vicki Daitch. True Genius: the Life and Science of John Bardeen. DC: Joseph Henry Press, 2002. Hoxie, Frederick E. 2017. The University of Illinois: Engine of Innovation. Urbana: University of Illinois Press. Irish, Sharon. “What Might a Polluted Creek Teach Us About Architecture?” In Design for the Environment/Proceedings of the 1995 ACSA West Central Regional Conference (October 1995): 79-84. Kruger, Betsy, and Jo Kibbee. “The Women, Information Technology, and Scholarship (WITS) Colloquium at UIUC: A Feminist Model for Education and Activism on Campus.” Feminist Collections 17:2(Winter 1996), 38-39. Pea, Bruce. 1995. The Prairienet Companion: the essential new user’s guide to Prairienet. Champaign. Pearson, Mike. 1995. Illini Legends, Lists & Lore: 100 Years of Big Ten Heritage. Champaign: Sagamore Pub. Peters, Justin. 2016. The Idealist: Aaron Swartz and the Rise of Free Culture on the Internet. New York: Scribner. * includes origins of Project Gutenberg and Michael Hart. ______, ed. Celebrating TAM’s First 100 Years: A History of the Department of Theoretical and Applied Mechanics, University of Illinois at Urbana-Champaign (April 1990). Prom, Chris, and Maynard Brichford. Andrew Barr of Urbana: An Illini who Shaped Corporate Finance and Armored Warfare. Pamphlet by University of Illinois Archives (May 1996). Talbot, Arthur Newell, Papers. University of Illinois Archives. Tate, Lex, John Franch, and Incoronata Inserra. 2017. An Illini Place: Building the University of Illinois Campus. Urbana: University of Illinois Press. Taylor, H. Jeanie, Cheris Kramerae, and Maureen Eben, eds. WITS: Women, Information Technology, and Scholarship. Urbana: Center for Advanced Study/University of Illinois, 1993. Uihlein, Marci S. “The University of Illinois, N. Clifford Ricker, and the Origins of Architectural Engineering Education in the United States,” for Journal of Architectural Engineering, DOI: 10.1061/(ASCE)AE.1943-5568.0000175. Winkelmes, Mary-Ann, Burton, Antoinette and Mays, Kyle, Eds. 2014. An Illinois Sampler: Teaching and Research on the Prairie: How world-class research makes its way into lecture halls and seminar rooms. Urbana, IL: University of Illinois Press.